Pakistani Prime Minister Imran Khan addresses during a ceremony in Kartarpur, Pakistan, Nov. 28, 2018. Pakistan Prime Minister Imran Khan led a groundbreaking ceremony Wednesday for a new border crossing with arch rival India, days after New Delhi announced it would support a corridor to facilitate its minority Sikh community to visit one of their holiest sites across the border. The fenced crossing dubbed a “corridor of peace” will link Indian border city Dera Baba Nanak, to Gurdwara Darbar Sahib, the final resting place of Sikhism’s founder Guru Nanak in Pakistani Punjab. Sikh pilgrim wait for food at the shrine of their spiritual leader Guru Nanak Dev in Kartarpur, Pakistan, Nov. 28, 2018. The Kartarpur corridor is supposed to be completed and opened well ahead of the 550th birth anniversary of the Sikh guru on November 23, 2019. 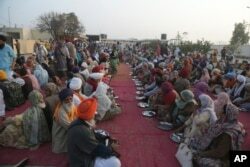 It will provide year round visa-free access to Sikh pilgrims from India after more than seven decades. In a speech after laying the foundation stone, Khan said Pakistan and India have both made mistakes in the past but they now need to work together to improve ties. “War is out of question between our two countries, which are equipped with nuclear weapons. It will be really crazy for both of them to even think about going to war,” the Pakistani leader warned. “Our countries must stop blame game. If France and Germany can leave their bloody past behind why can’t India and Pakistan break the shackles of the past." Khan assured Sikh visitors from India that they will find their worship place and surrounding complex a completely developed structure equipped with all facilities and comforts when they visit Pakistan for the 550th birthday celebration of the Sikh guru. 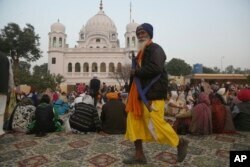 India's and Pakistan's independence from Britain in 1947 divided the Punjab province, where Sikhism was born. The idea to open the corridor has been floated around since the 1980s, never coming to fruition due to the tumultuous relationship between the two nuclear armed South Asian neighbors. The proposal received a fresh impetus in August when Pakistan’s army chief, Qamar Javed Bajwa, told Indian minister Navjot Singh Sidhu, who was in Pakistan to attend the oath taking ceremony of Khan, Islamabad would be willing to open the corridor. General Bajwa was among the big gathering of guests at the groundbreaking ceremony, including diplomats, Indian journalists, Sikh devotees and a ministerial level delegation representing Prime Minister Narendra Modi. Last week, the Indian cabinet, chaired by Modi, approved the move. 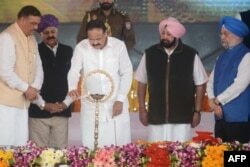 Indian Vice President Venkaiah Naidu performed the groundbreaking Monday on his side of the corridor at a ceremony just two kilometers from the Pakistani border. Indian Minister of External Affairs Sushma Swaraj Wednesday played down expectations the corridor could lead to the revival of official talks between the two countries. Indian VP Naidu (3L), Union ministers Nitin Gadkari (6L) and Hardeep Singh Puri (5R), Punjab Governor VP Singh Badnore (2L), and other officials stand for the national anthem during the foundation stone-laying ceremony for the planned Dera Baba Nanak-Kartarpur Sahib road corridor to the Pakistan border, at Dera Baba Nanak, Nov. 26, 2018. "The moment Pakistan stops terrorist activities in India, the dialogue can start but the dialogue is not connected with only the Kartarpur corridor," Indian media quoted her as telling reporters in Hyderabad ahead of the groundbreaking on the Pakistani side. The Indian external affairs minister had also been invited to attend the ceremony by her Pakistani counterpart, but she expressed her inability to undertake the visit due to prior commitments. Previously, Indian pilgrims had to take a visa and arrive in the Pakistani border city Lahore before taking the 2-3 hour journey to the shrine. The new corridor, which is planned to remain open year round, will cut their journey to a mere 6 kilometers. A Sikh pilgrim visits the shrine of their spiritual leader Guru Nanak Dev in Kartarpur, Pakistan, Nov. 28, 2018. The temple is visible on clear days from a viewing stage on the Indian side, where religious devotees gather every day to have a glimpse of it. Politicians on both sides have hailed the decision as an impetus for peace between the two countries that have fought several wars in their seventy-year existence. In the last few years, violence, including cross border shelling from both sides, has intensified in the disputed Kashmir region that both sides claim. Pakistan Information Minister Fawad Chaudhry called it a victory for the peace lobby in both countries. However, other analysts were less optimistic. “I don’t think it has any enduring significance apart from being stand alone. I see it as pure symbolism and I don’t see it as any change in either country’s basic positions,” said Ajai Sahni, the executive director of New Delhi based Institute for Conflict Management. He said the move was an effort by the Indian government to please the Sikh community ahead of next year’s general elections. “Everyone is looking for whatever they can do to get a few extra votes,” he said. Days before the ground-breaking ceremony, India complained to Pakistan about not allowing officials from its High Commission access to Indian pilgrims visiting Pakistan for the Guru Nanak birth anniversary. Pakistani Foreign Ministry spokesman Mohammad Faisal rejected the charges. “India is a habitual alleger and it has become its second nature to blame Pakistan for any negative development, without blinking an eye,” he asserted. India blamed Pakistan for supporting a Sikh separatist movement several decades ago and allowing the remaining leadership of that movement to live in Pakistan. The chief minister of Indian Punjab, Amarinder Singh, while welcoming the Kartarpur corridor opening, refused an invitation to attend the ground-breaking ceremony citing Pakistan’s support for terrorism in Indian Punjab. “In the past 18 months we have smashed more than 15 terror modules. We have found Kashmiri terrorists in Punjab. How are we expected to tolerate all this?” he told Indian newspaper The Hindu.